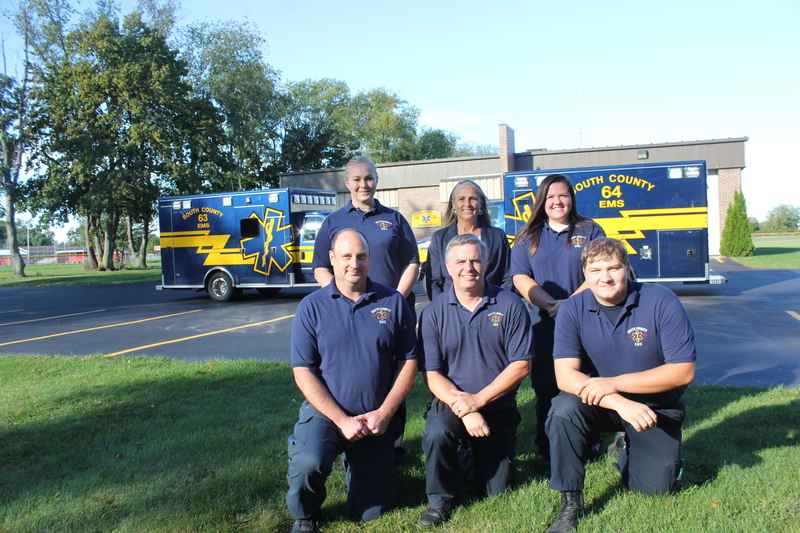 Staff of the ambulance service with their new vehicles in the background are from left to right front row: Jake Kuiper, Mike Nemeth, Chris Koeneke. In back from left to right: Amber Louis, Vicki White, Ally West. Ever wonder how fabulous flapjacks could benefit those who are in need of United Way services? Come and find out says Ann Marie Earl, the instigator of the 2015 Fabulous Flapjack Fundraiser on Wednesday, October 21 from 7 to 9:30 a.m. at the Vicksburg Methodist Church on S. Main Street. “We want to support the struggling families in South County,” says Earl, who is the staff person at South County Community Services who wanted to find a way to showcase the good that United Way does in this area. She has organized a big group of volunteers to cook, greet, serve, bus tables, and clean up the fresh hot pancakes, sausage, coffee and juice that they have planned for this community breakfast. There is no charge for the food, but a donation to the Vicksburg United Way will help support the work of South County Community Services, Boy Scouts, the Library’s summer reading program, and other potential recipients of the United Way funds. The hope is to have a huge turnout to support this endeavor, Earl says. Ann Marie Earl displays the invitation to the 2015 Fabulous Flapjack Fundraiser, which will push the United Way thermometer to a much higher level. To raise awareness, the Vicksburg United Way campaign has entered in to a challenge with the Gull Lake United Way campaign, according to Laura Howard, Vicksburg’s chairperson. The contest to raise the most funds for each community will have an extra benefit for the winning team she explained. Based upon a rather complicated scoring mechanism to determine the winning community, there will be an extra $1,000 awarded to the school district to use for a program area that is unique and lacks funding. If Vicksburg wins, Superintendent Charlie Glaes has determined the grant would go to funding the STEAM startup program at Indian Lake School. A Project Lead the Way (PLTW) program through KRESA has begun at Indian Lake Elementary School in Jake Biernacki’s art class. In this classroom, students he works with will be exposed to the visual arts in companion with science, technology, engineering, and mathematics. The course work is called STEAM and teaches children creative problem solving through application of the many facets of the STEAM program. The students need more iPads to have in use at any one time. If Vicksburg’s United Way is successful in its challenge to Gull Lake, the $1,000 will buy three more devices and a case or two. Vicksburg’s campaign raised $34,000 in 2014. The challenge with Gull Lake will be to increase the percentage of new businesses contributing, the percent of new donors, and the dollars raised year-over-year according to Howard. Her counterpart, Chris Tracy, has his committee plotting and planning, so Howard is urging her group composed of Travis Cree, Danna Downing, Gen Landtroop, Carol Lohman, Sue Moore, Tim Moore, and Tonya Nash, to get moving. Guests at the 2014 GHI Extravaganza enjoy the selection of hors d’ouevres. 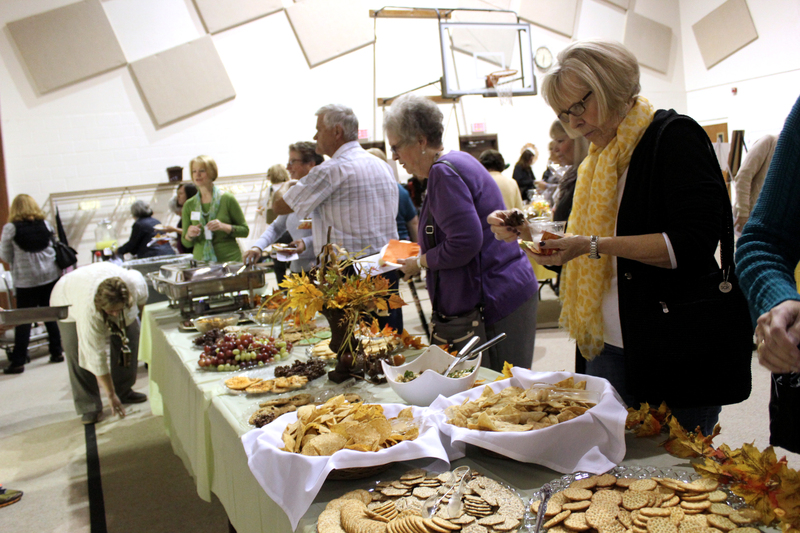 Generous Hands (GHI) will host the annual Fall Extravaganza from 6:30-9 p.m. October 15 at Lakeland Reformed Church on Sprinkle Road. Generous Hands is a Vicksburg-based nonprofit organization that provides backpacks filled with food on Fridays to children who qualify for free or reduced breakfast and lunch programs who would otherwise go hungry over the weekend. This year money raised at the extravaganza will go to support Family Fare vouchers for the 2015-16 school year. In the Vicksburg Community School District, the number of children receiving free or reduced lunch as increased by 72 percent since 2004 when Generous Hands began. In 2015, 873 students were enrolled in the free and reduced lunch program, 34 percent of all students in the district. Sheri Louis, executive director of Generous Hands, said the event is “our biggest community fundraiser and a great way for us to bring awareness to the community of the need to feed our children. Food purchase expenses are more than $24,000. More than $27,000 is spent for weekly Family Fare vouchers for students who qualify in the Vicksburg district for milk, bread, eggs and vegetables to each family. This fundraiser is very important to the organization so it can continue to provide the services that benefit so many. This year the Fall Extravaganza will once again feature Chef Ryan Soule, owner and executive chef of the Oakwood Bistro in Kalamazoo, and Natalie Fuller, known as the “Cheese Lady,” from her Texas Corners shop of the same name. In addition to the cooking demonstrations, there will be a silent auction including hand-crafted jewelry, quilts, artisan-created blown glass, pottery, local services, cookbooks and several themed gift baskets, Louis said. The GHI volunteers are selling tickets be purchased in advance and urge the public to buy in advance of the event. Tickets are $10. Seating is limited. Call (269) 370-7965 for tickets or ticket information. Helen Kleczynski, owner of the Art House on W. Prairie Street in Vicksburg, flew off to New York City recently to accept the French Canvas Award at the Pastel Society of America Exhibit for her painting “Old Blue”. 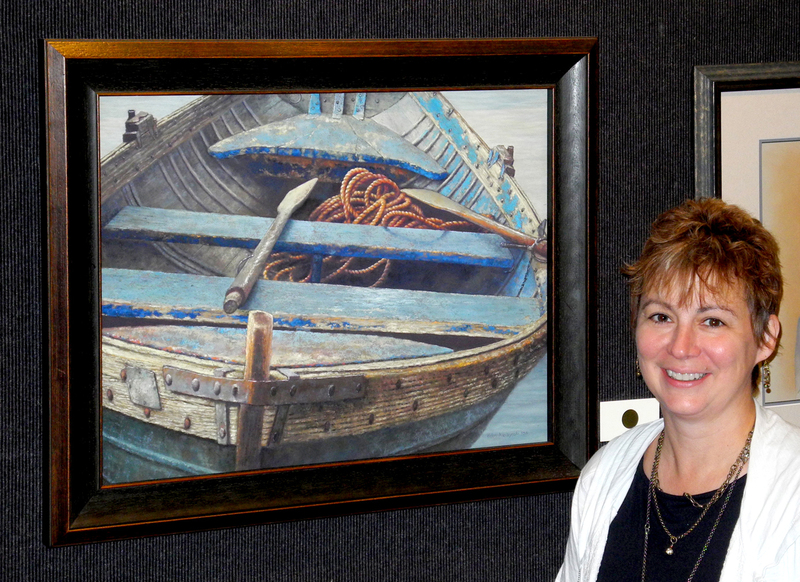 For her winning painting, Helen found an old boat at a museum in Glen Arbor and was inspired to capture its texture. It will also be featured in the December issue of the Pastel Journal, in a step by step demonstration on how to capture textures in pastel paintings. Last year, Kleczynski won an honorable mention for her painting “Just a Vessel”, in the 16th annual Pastel Journal 100 competition. Her painting “Porch Light” will be included in the eighth edition of Strokes of Genius. Porch Light, depicting a building in Rockland Maine, was also a big award winner in the 15th Annual Pastel Journal 100 competition. The artist placed second internationally among thousands submitted, fetching her a complete line of pastel products sold by the Richeson Company. Kleczynski didn’t stop with one prize. She earned fifth place in the Still Life and Floral division in 2014. Her pastel entitled “Rosewood Ribbons,” came from an inspiration while buying flowers at Rosewood Café, when it was still in operation. She found the many colorful ribbons hanging on the wall to have possibilities for teaching cylinders to her students. “As I worked on the painting, it became more of a challenge in creating edges, some hard and others soft. It was also the perfect opportunity to demonstrate working with different colors and surfaces,” she says. Artistry seems to run in Helen’s family. Her mother was an artist and her daughter, Amy Garro, is making her own way in the art world. She just published a quilting book, Paper Pieced Modern, which has patterns for many beautiful quilts displayed. She lives in Indianapolis with husband and three boys under the age of five. She has been quilting since she was in third grade, explains the proud mom. Melinda Kleczynski earned a degree in math from the University of Michigan. She attended veterinary school and now is going to night school in Grand Rapids studying biological statistics. Son Peter has a degree from Hope College in English and philosophy and is now a massage therapist in Asheville, North Carolina. Kleczynski’s students’ art works along with some of her own will be exhibited in the new Vicksburg Arts and Cultural Center at different times of the year. They can also be seen at The Vault, East End Gallery in Marshall, Synchronicity in Glen Arbor and Amy Zane’s in Kalamazoo. 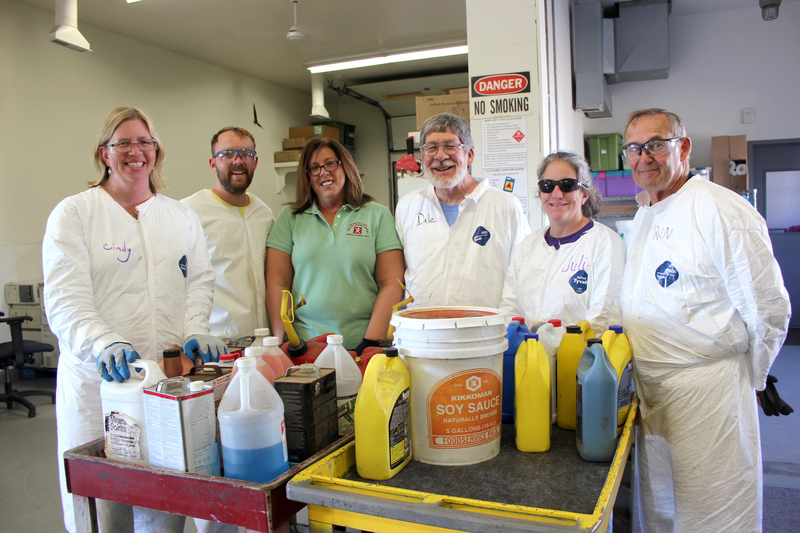 Staff of the Household Hazardous Waste collection depot, gather for a group photo. Director Jennifer Kosak, from Vicksburg, is in green. Each week, nearly 300 people pull up to the Household Hazardous Waste Center on Lamont Avenue in Kalamazoo to drop off items no longer useful but not permitted in ordinary trash. They’re disposing of -everything from batteries, fluorescent bulbs and chemicals to old TVs and computers. They would be impressed with what goes on behind the scenes with the stuff they have handed over to the guy or gal in the Tyvek suit. The seven employees of this county facility sort, classify, record and secure every object that comes in the door. At the end of each day’s collection, they make sure nothing is leaking or otherwise contaminating their building. Many of the chemicals they receive are volatile and could cause a buildup of fumes if not handled correctly, said Jennifer Kosak, the facility manager. Kalamazoo County’s Health and Community Services Department oversees the HHW Center. This facility’s weekly year-around operation is one of the very few in Michigan. Collections in other counties are more sporadic, primarily because of the costs involved. The county board has supported household hazardous waste disposal since 1988 when collections were held at county buildings and parking lots. In 1993, an opportunity to build a permanent center came through a Michigan Department of Environmental Quality grant to promote groundwater protection. The HHW Center opened for business in 1997, across from the county animal shelter and jail. Starting out with one full time employee and two part-time staff, it now has two full time employees, Kosak and Cindy Foster, two employed 30 hours a week, two employed for 24 hours a week and a call-in person. The county currently contracts with the licensed waste hauler ERG Environmental Services in Livonia, to cart away chemicals each month. In the second quarter of this year, the company picked up 37,269 pounds of materials. Valley City in Grand Rapids picks up electronics. In the second quarter, that company picked up 103,782 pounds of residential electronic waste. Other items such as oil, antifreeze, mercury and pesticides brought the second quarter total to 200,579 pounds of residential and small business waste diverted from the landfill, to be recycled where possible or disposed of in a nonhazardous manner. Residents of the city of Kalamazoo are the largest group of users with those in Portage close behind. Residents of the remaining Kalamazoo County villages and townships, Schoolcraft and Vicksburg included, comprise a small proportion of the total usage. In 2015, Schoolcraft provided $300, Vicksburg, $600. The county also contracts with Calhoun and Berrien counties, and Antwerp, Almena, and Paw Paw townships in Van Buren County. Out-of-county contract partners pay 100% of operating costs plus disposal costs. The Household Hazardous Waste Center is open Tuesday and Friday from 8 a.m.-1 p.m. and Wednesday from noon-6 p.m. as well as the second Saturday of the month from 8 a.m.-12 p.m. Even with limited hours, “People who want to recycle will find a way to get here because they make the conscious decision to do the right thing with materials they no longer want. We do not have the staff or facility space to increase open hours at this time,” Kosak explained. “The amount of electronics and chemicals we receive each month is amazing. We work hard and are proud that there is a place where people can dispose of their hazardous waste, right here in Kalamazoo.” Kosak is a Vicksburg resident and would love to see more people from the south county area take advantage of the HHW Center. Some of the items they don’t take are used needles, Styrofoam, and latex paint. More information, including how to dispose properly of those prohibited items, can be found at www.kalcounty.com/hhw or by calling 269-373-5211. 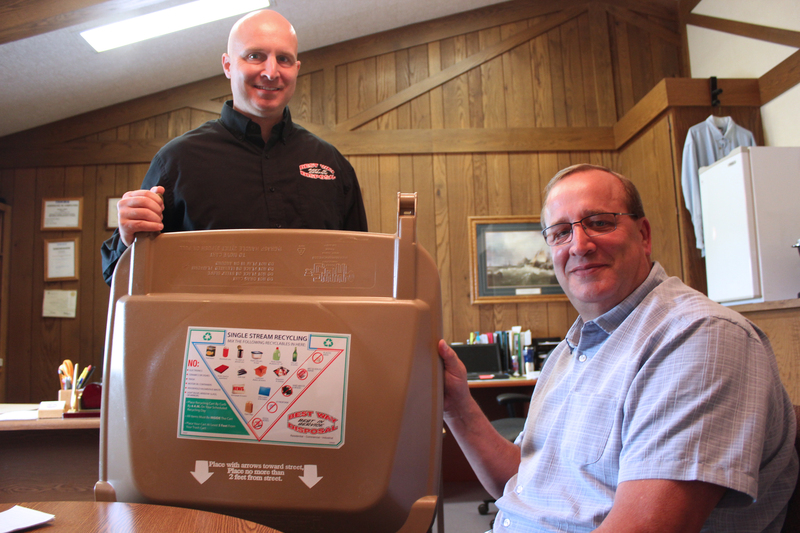 Chris Phillips and Steve Graffenius show the legend on top of all of Best Way’s curbside bins that helps their customers determine what will be acceptable for recycling. Recycling is a feel-good thing for those who practice it. The good feelings come for each individual who takes the time to separate materials from their trash and know it won’t go into a landfill. But Gov. Rick Snyder tells us that just 14.5 percent of Michigan’s residential waste is being recycled. In most of the other 49 states, the percentage is more than 30 percent, according to Michigan Department of Environmental Quality. Snyder’s administration is working hard to change this percentage with 2017 cited as the year to reach 30 percent recycling. What’s possible? Some California communities recycle 75 to 80 percent of their trash. Right here in south Kalamazoo County, residents have the option for single stream recycling through contracting with the local garbage haulers, Best Way Disposal, BFI, Waste Management, and Republic Services. But how does one know what happens to what has been sorted for garbage and/or recycling? Representatives of Best Way, the only locally owned service, say their recycling services offer curbside bins for pickup so residents’ trash will be reused and kept out of a landfill. The price is $12 for four months for three big bins. The industry now promotes single stream recycling, where all recyclables are placed in one container. The materials are sorted. Much of the waste is sold. Some, however, does end up back in a landfill, sometimes because the sorting is incomplete. But it’s also in part because many people don’t know what they can put into the brown-topped bins that Best Way picks up, according to Chris Phillips, Best Way’s public relations manager. The items need to be clean and devoid of food scraps, Steve Graffenius, the liaison to Schoolcraft and Vicksburg’s annual trash pickup said. • Plastic bottles and tubs that have the recycling icon/logo on them, mostly rigid plastic (numbers 1-7 in the triangle). • Glass bottles of any color. • All kinds of paper, newspaper, magazines, office paper, paper bags. • Tin cans and aluminum. • Styrofoam food & drink containers. • Pizza boxes, often contaminated with food or grease. • Cloth, rags, tarps, garden hoses, laundry baskets, big wheels (kids’ toys). • Food pouches that some baby food items are packaged in, along with other pouches that have prepared food in them. It’s also important NOT to bag anything that goes into the recycling bins, Phillips said. The market for plastic, newspapers, tin and aluminum has deteriorated considerably because the price of oil has gone down so much, Graffenius points out. The commodity markets fluctuate monthly in good times and bad. “We are paying a lot right now to have our material recycled. We want to be a good neighbor and a full service disposal company, so we will continue to promote single stream recycling. Best Way does not process the tons of material it picks up in the recycling program. The recyclables are trucked to locations in Kent County, Holland West Shore Recycling, and Elkhart Recycle works. When it arrives on a daily basis at these recyclers, it is dumped on long conveyer belts that sort the scraps through the use of magnets for metal, air for lightweight items, screens, and sensors that kick out unusable items (which do end up in the landfills). The recyclers bale the paper and sell that where possible. The plastic is sorted and graded and resold, as is the glass. Best Way owns a landfill at Orchard Lake in Watervliet which it covers every day. The landfill employs a gas collection system that sends the methane to a generating station capable of providing electricity to 2,000 homes when at full capacity. At current volume of waste, the life expectancy for this landfill is roughly 60 years.